Well, that didn’t take long did it. No sooner was Stephen Halsey promoted to Deputy Chief Executive of Tower Hamlets Council than a wearily inevitable report appears under his name for the borough’s cabinet meeting on August 3. I’ve seen quite a few cabinet reports in the past few years while watching Tower Hamlets Council, but this has to be one of the most extraordinary. Last September, in the run-up to October’s Mayoral election, I predicted that in the event of a victory for his friend Lutfur Rahman, millionaire housing association tenant Shiraj Haque would be determined to wrest back control of the annual and lucrative Baishakhi Mela festival. Was this one of the reasons why he backed Lutfur Rahman’s bid to become the first directly elected mayor of Tower Hamlets? Time will tell. Well, time is beginning to tell. Last month, I reported here that Mr Halsey had been holding meetings with the businessman (then positing himself as the head of a so-called Baishakhi Mela Advisory Board) about how he could “advise” on the running of the three-day event. Here’s a bit of background. Up until 2008, the Mela was organised by a “Baishakhi Mela Trust” controlled by Haque. in the run-up to the 2008 event, there were a number of quite serious allegations levelled against him, including ones made by then MP George Galloway that he might have been using the festival to smuggle Bangladeshi artists into the UK. Haque strongly denied these claims. ‘provide no assurance that the financial practices and controls adopted by the BMT are sufficiently adequate and effective to enable robust financial management of the trust’s funds’. Haque’s trust was therefore shunned by the council, which was led at the time by Labour’s Denise Jones, and the Mela was run in-house from 2009 onwards. Despite all this, history is being whitewashed and rewritten in Lutfur Rahman’s new Mulberry Place. Shamefully, Mr Halsey seems to be going along with it: there is not one mention of that Deloitte report or the financial irregularities in his new cabinet paper. During this period [2002-2007] there was growing disagreement within the community as to who should run the Mela, with two groups contesting the right – the BMT and the New Banglatown Baishakhi Mela Trust. In 2008 the issue came to a head when both organisations sought to run the event on Weavers Field on the same day. The 2008 Mela was again organised by BMT without financial support from the Council. Mr Halsey now says Haque’s Baishakhi Mela Advisory Board has now proved itself clean and capable. He says it’s now time for the council to bow out. Except it won’t because even in these hard-pressed times, when every penny spent is a penny less for social care for example, the council will continue to provide a public grant to this commercial event. Mr Halsey has even agreed to fast-track an unspecified amount of Section 106 planning gain money to help (cash that could be spent on cultural programmes in schools). So who will be in charge of spending our money then? Fear not, Mr Halsy says. Why? Because there’s going to be an “Independent Panel” who will interview and recommend a “preferred applicant” to Cabinet to decide. Quite who will be on this Independent Panel, who chooses who will be on it and who picks the shortlist for interviews is not clear. Let’s hope all this done in the open. Perhaps they should consider webcasting the interviews. I’m sure it would generate a decent audience at no cost. And, amazingly, this new contract will be for nine years. 6.1 During the development and implementation of the 2011 Mela there was increased engagement with the community, primarily through the voluntary Baishakhi Mela Advisory Board, but also through a more localised Mela Parade which involved a number of local organisations. There was a strong desire shown to return the Mela to community management and this report sets out a process for achieving this that relies on the community forming its own management arrangements rather than the Council trying to undertake this process. · Paperwork finalised and the right will be awarded for a period of nine years, with reviews at the end of one, three and six years. The review will be undertaken by the Independent Panel. · Board members will be selected by the Trust, but the Council would, to protect its own reputation, expect them to comply with the highest standards (i.e. people without criminal records). The Council will, in 2012, passport remaining S106 (Balleymore) funding that it has secured for the Mela and which has to be used forparticipatory elements of the event. And who is the cabinet member in charge of culture? Ex-SWP member/Respect, Labour and now Independent councillor Rania Khan. 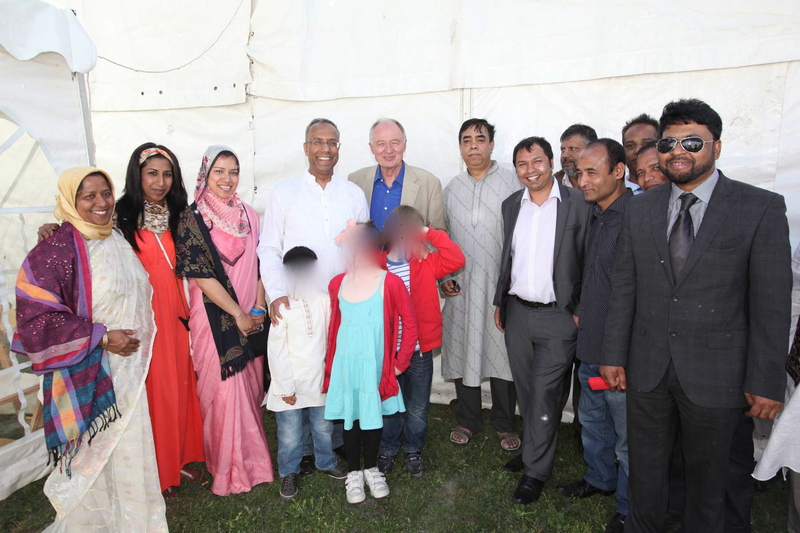 Here she is with third from left at this year’s Mela with Shiraj (her mother, fellow ex-SWP member Cllr Lutfa Begum is on the far left). Rania Khan: By the way for ur info Siraj is my mama meaning my mums brother who saw ne in my nappies. This doesn’t necessarily mean that Rania is Shiraj’s blood niece, just that their families are very close. I wonder if Rania has declared this relationship to council officers? I’d imagine it would rule her out of any official discussions, either with Shiraj or around the appointment of members to the Independent Panel. The thing is, Ted, that if you take someone’s money you owe them. It’s not going to be a scoop if Haque gets the Mela back, although it will be an insight for you to boast about. I was speaking to a former cabinet minister the other day and told her I planned to ask the union for some money to do a community project. She warned me that I’d owe the union if I took the union money. It’s the same thing. By the way, Haque’s crowd wasn’t at the Town Hall after you published the homophobic piece. Maybe Lutfur had had as much as he could take and finally sat Haque down for a conversation. Are you saying the Mela money was Haque’s (to take and give back)? I think you should brief yourself a little better on what actually happened. I think what #1 is referring to is the fact that Lutfur owes a lot of money to Shiraj and others for his election campaign and has to pay it back. One of the ways was for council property to be sold off below market value for unspecified ” community” gains. The obvious media scrutiny of everything Lutfur does means that the kybosh was put on that and so it is back to the Mela. Everyone knows that the thing will be robbed blind and the fact that this report doesn’t mention the original auditors comments is gross negligence. Or is it corruption? Everyone is related to everyone Bengali one way or another dude. You really need to get to know Bangladeshi’s a little more. It’s a small world here in Tower Hamlets, everyone is connected!!! Of the Bengalis I asked today whether they’d describe Shiraj as their mama, none said yes. Would you? ‘row on Facebook’ eh? There were many rows surrounding Rania hugging Mr Hoque, there was even a blog set up to say how ‘un-Islamic’ she was. I was appalled at the disgusting way Rania was treated. Rania was defended by the so called ‘Islamic extremists’ Lutfur supporters on her right to do and wear what she pleases and attacked by anti-Lutfur for being ‘un-Islamic’ and hugging a non-mahram man and wearing tight clothes. These attacks came from cowardly fake profiles. These fake profiles supported Abbas who was portrayed as a liberal Muslim. When it suits them they call Lutfur and his supporters extremists then display the most misogynist, extremist behaviour using fake profiles. I cannot believe a Muslim woman was treated in such a manner. Where were the right wing press then with their rightous anti-Islamic anger? Nowhere to be seen because what was happening was contrary everything they believed: Lutfur and his supporters are the extremists and Abbas and his supporters are the liberals. Whilst we’re on the subject; whilst at a polling station at the Executive Mayoral I witnessed a Bangladeshi male Labour campaigner bully a group of Lutfur’s Bangladeshi women campaigners. I shall always stand by a woman’s right to wear and do as she pleases unless it is against the law. I shall fight against all those who try to restrict a woman’s freedom for political gain or any other reason. No woman should be publicly humiliated for what she wears and does, if she has done something illegal by all means get her arrested or shut up about it, and if you have something to say why hide behind a cowardly fake profile? As I had said at the time calling someone ‘uncle’ in Bangladeshi community does not mean blood relations always, we call our elders, especially if they’re our parents friends ‘uncles’ and ‘aunts’ and if their our friends or our age we call them ‘brother’ or ‘sister’. How can you use a cultural practice to decide who is allowed to work with whom? I’ve even heard white councillors call Bengali councillors ‘bhai’ (brother)! I saw the abuse Rania was getting on Facebook yesterday and was appalled. I’d like to do a post on that. However, on the question of ‘uncle’, I’ve already said it’s not necessarily a blood relationship. What is of significance though is the closeness of Rania/Lutfa’s friendship to Shiraj Haque. Can you imagine the national outrage if a major business figure, such as, say, Rebekah Brooks, approached a close friend the Prime Minister to discuss a business deal? Oh, hang on a minute…. (it’s called transparency and probity, something that Lutfur and several of his predecessors do not seem to understand). Can someone give a link to the facebook and the blog, I can’t find them? I am a little mystified by the opening question of this article. As far as I can see this is the first reference to facebook and Rania. Should have been thought, obviously. Try leaving accusations of murder out and it might get through. bangladeshinuk.co.uk 17/12/11 Rania Khan tells more porkies. I tried that link but couldn’t find anything. The site seems to be selling stuff. What we’re witnessing in Tower Hamlets is unprincipled sycophants, jostling for power and status and really bringing the bengali community into disrepute. The retort from Rania Khan that Shiraz is of close historic relations to her is a grotesque lie. It makes me laugh in amusement. By the way people who are following, shahanara begum is a close friend of Rania Khan and a ‘journalist’ from that shambolic toilet roll that is the London Bangla or whatever it is called nowadays. Both Lufur and Abbas’ camp are illiterate dinosaurs who give a bad reflection of the bengali community. It pains me to see such a plethora of talent in Tower Hamlets that is not being utilised from all political peruasions. People who are principled and give a damn about the public good. In view of your choice of the word ” illiterate” Bodrul, perhaps you might like to rewrite your post. I seem to remember somewhere that Abbas Uddin claimed on a CV an MA in English although I would agree that a law degree notwithstanding Mr Rahman sometimes has difficulties with the finer points of the language of, amongst others, Tagore. Mind you he has a problem with a whole series of things beginning with the truth.